Fiology thanks Stephen Baughier, the founder of CampFI, for shaping this lesson. Chances are no matter where you are on your own Financial Independence journey, you don’t have physical interaction or discussions daily with people at work, in your neighborhood, or even with your family about your philosophy about the relationship between your money and happiness. You want to connect with others who think about this stuff in a similar way. In order to help create and maintain positive momentum through your own journey, it is important to influence and be influenced by those with similar goals. I can emphatically say that I don’t know, and have never known, a community more generous with their time, knowledge, and positivity than that of the Financial Independence community. 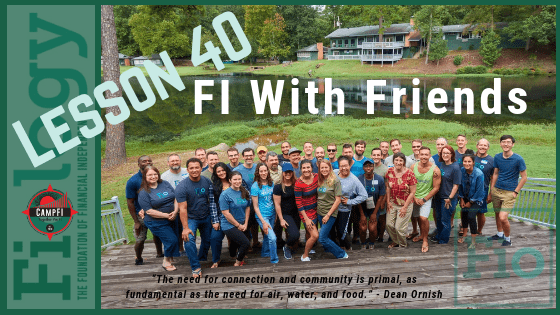 The FI community represents those who value money as a tool for what it can help establish, an environment where we can focus on what makes us happy and fulfilled. And those values and sentiment reinvested in the FI community only make this community stronger. The tagline of CampFI is “Together We FI” and it captures the togetherness that we feel belonging to the FI community, the cooperation of those in the FI community who share knowledge and experience to help each other, and the association among us, knowing that there are others with whom we can share our personal and professional challenges related to our FI journey. These characteristics are represented throughout the FI community. The purpose of this lesson is to inform us of the current options available and encourage us to reach for support beyond our normal day-to-day communities. Take Action: There are established FI communities and events and opportunities for you to become an integral part. Here are a few recommendations to help support, and grow with, the FI community. Real World Events: Hands down CampFI is the most accessible and life changing FI event you can attend. The event planning criteria include making the events affordable, even for those just starting out on their FI journey. Visit the official CampFI website and Google CampFI to learn more about the power of community and determine which location works best for you! Other popular events to consider are FI Chautauqua and Camp Mustache. Online Community: If you haven’t already, go to the ChooseFI Facebook Group and request to join. This is one of the most useful (and friendly) Facebook groups out there. Here you will find others on their financial journey and experts that generously share their knowledge. Note: ChooseFI has established many local Facebook groups where you can meet people in your area through local meetups. Check out their primary Facebook group site for more information. Strengthen the Community: Support others within the community by by leaving positive and constructive comments on their blogs and social media. Consider purchasing desired products from those within the FI community. Introduce the FI community to those you believe would find it beneficial. This can be done by discussing your journey and suggesting they enroll to receive Fiology lessons and inviting them to join you at a CampFI.